My husband burst out laughing the moment he laid eyes on Leona Lilly--my (then) foster dog from Richmond Animal Care and Control. Considering I had not expressly* told him I was getting another** foster dog before he left for work that morning, it was NOT the reaction I had envisioned. * He had not asked whether I was getting another dog; therefore, I did not tell. Mornings are stressful, so I pick my battles. Don't judge. ** I had told him that I was returning Abdul, our current foster dog (a chihuahua mix with pharma-managed epilepsy, but otherwise, exceptionally easy), that day (he was due to return for a medical test so he could be released for adoption). If I'm being honest, I was counting on my husband to forget what I'd told him while he was rushing out the door, and not notice right away that Abdul had been replaced. I mean, how different could two, 10-ish-pound, fawn-colored chihuahuas be on the surface? I'd planned on springing the news that Abdul had been long-gone only upon confrontation. 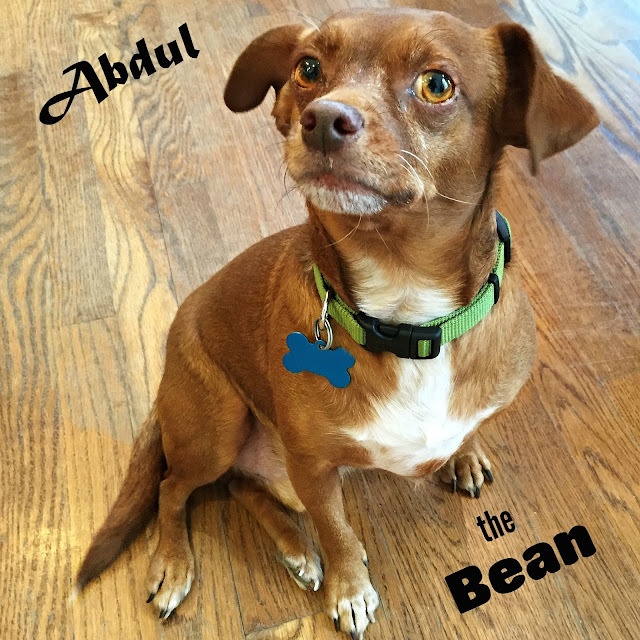 Let me explain: so, Abdul (who we called affectionately, Bean, because he was shaped like a pinto with legs) was compact, calm, agreeable, clean, shiny, behaved, and thoroughly enjoyed a good nap). In other words, he did no wrong. He was actually a bit of a space cadet (why, no one was sure, but it was suggested that previous un-managed seizures had caused permanent cognitive damage), preferring to stare into space vs. have any reaction whatsoever to activity in and around his bed. He basically only got excited for food. 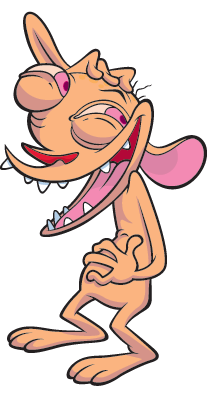 OK, it's Ren from Ren & Stimpy, but they could've passed for twins, I'm telling you. Despite having barnacle-like growths on her balding coat, only three and a half teeth, infected ears, shifty eyes, and wobbly knees, however, she was taking no crap from my husband. As soon as she had him in view, Leona launched into the worst-sounding, throaty, wheezy, screaming fit you have ever heard come out of a decrepit chihuahua. 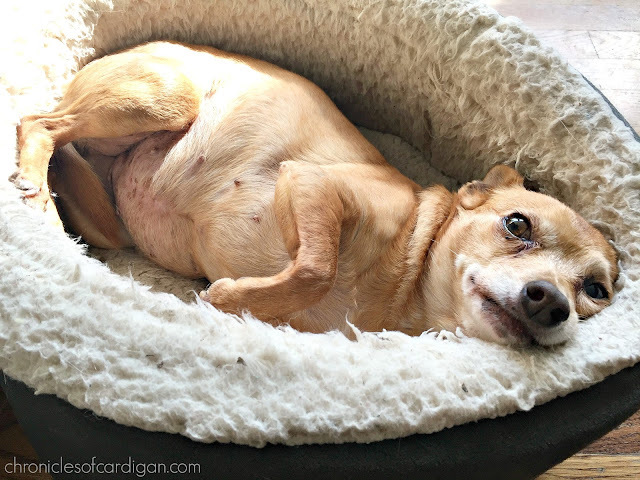 My husband must've really needed that belly laugh, because--despite her myriad medical issues, months of extensive (and expensive) veterinary care, and attitude--he never questioned nor protested her being here. 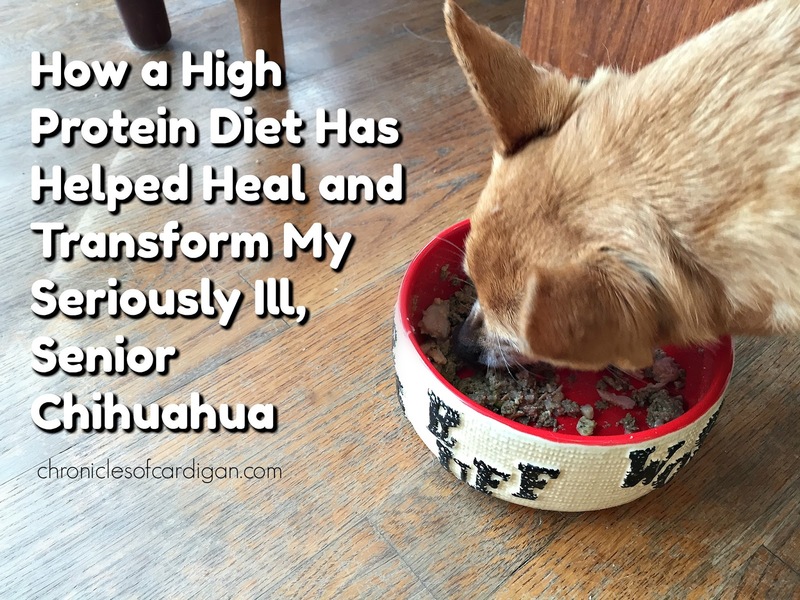 It was the best foster chihuahua bait-and-switch ever executed! Leona (now Lele, and officially ours) is fully* recovered! * As fully as can be; we're managing the autoimmune disease of her skin with medication, and she's on a joint supplement for the wobbly knees. And her, formerly nasty, coat looks GREAT! Healthy Lele lives and loves hard. Y'all, she was balding, and greasy, and scaly, and stinky, and oozing when I got her. It was so sad that I only took pictures of her in sweaters, or of her face only, so no one could see how bad she looked. You have no idea how far she's come health-wise over the last year. And it's not just because of the low-dose steroid she's on, or the joint supplement, or the fact that she's pampered and cared for, it's BECAUSE OF HER DIET! Wellness® CORE® Dog Food Has Made a Huge Difference In Lele's Health. Wellness CORE, now in two kibble varieties. What corgi? I don't see a corgi. Oh, and Lele LOVES the stuff! At the end of last year's three-month trial (and with the help of a wonderful veterinary dermatologist who prescribed all the right medications), Lele was definitely on her way back to health....though, we were still in the dark about the cause of her illness (more on that in the second post in this series). Today, though? Lele is doing (and looking) GREAT! Once we got the cause of her illness diagnosed and managed, the balanced nutrition she was getting from Wellness CORE truly pulled her through. Lele no longer has "barnacles," bald spots, greasy or stinky skin. 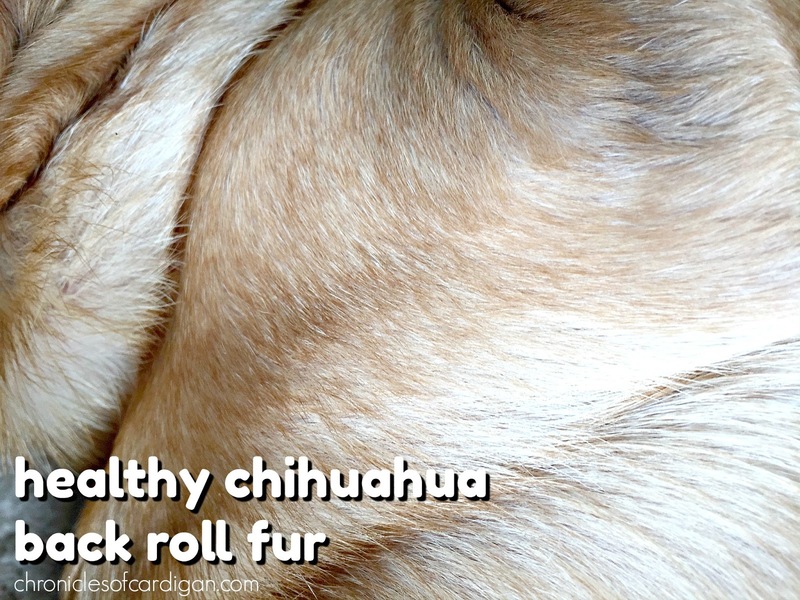 She has the thickest, shiniest, regular (fairly clean) chihuahua-smelling coat that you will ever see! 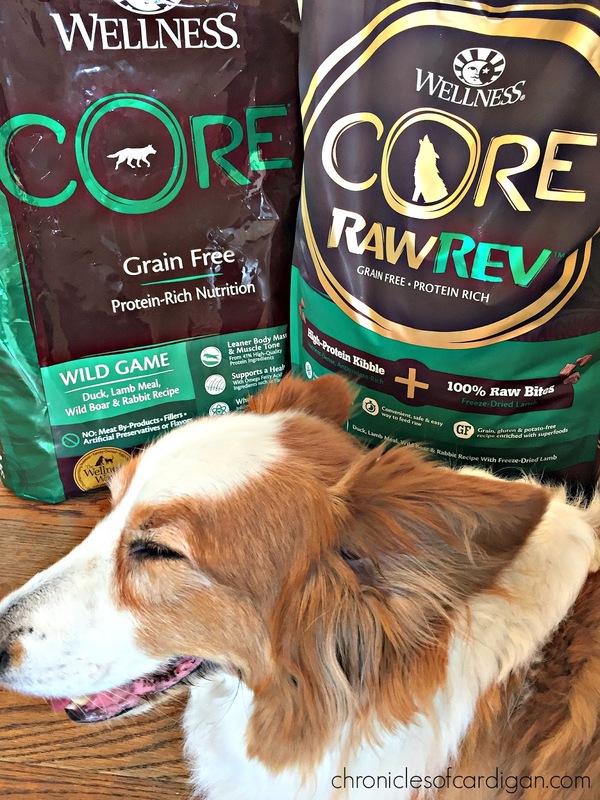 And Now the Wellness CORE Kibble Line Has Been Expanded to Include Wellness® CORE® RawRev™, the Same CORE Kibble Infused With Chunks of Whole, Freeze Dried Raw Meat! Raw meat protein, in addition to appealing to a dog's sense of smell and being highly palatable, is packed with the nutrition that dogs need for whole body health. 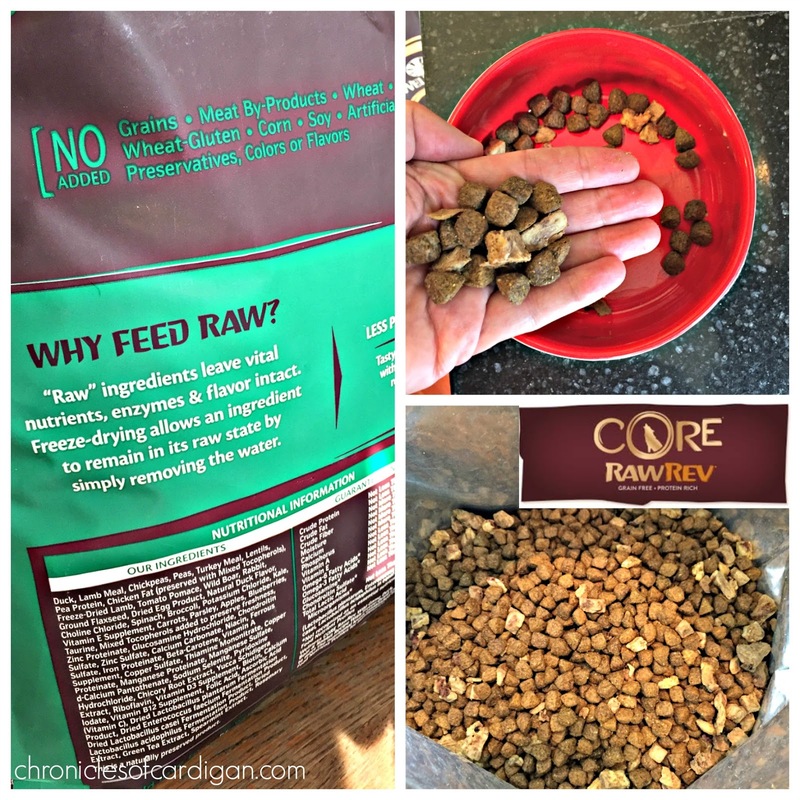 Though feeding an all-raw diet might not be an option for some (me included), feeding a high quality kibble with added raw meat protein is. And Wellness CORE RawRev makes this option easy, safe and convenient! Lele has just started her switch from original Wellness CORE kibble to RawRev. I'll return next month to tell you how it goes! 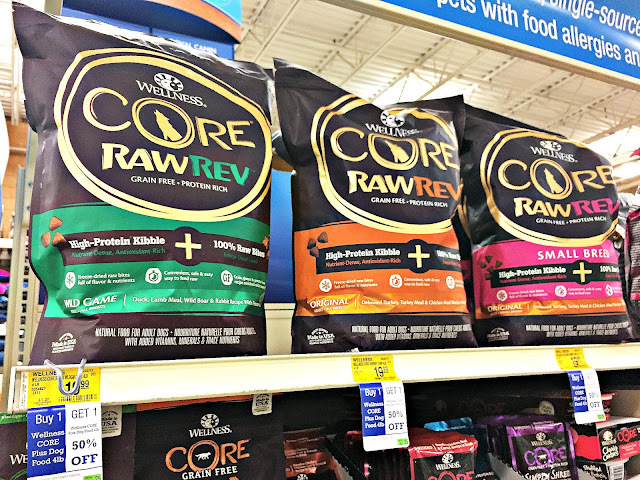 Is your pet eating* Wellness CORE RawRev dog food? Buy one and get one 50% off at PetSmart and unleash the power of raw! * Remember to switch your dog's food gradually to avoid stomach upset. Refer to package directions. What is your experience with feeding your dogs raw food? Would you? Do you have a senior dog? Are they on a high protein diet? We have freeze-dried raw food on the boat. It's a nice supplement and easy to keep when we don't have refrigeration while sailing. So glad that Lele is getting healthier all the time. She must be so happy she ended up in your home. Freeze-drying is a beautiful thing. ☺ I bet Honey enjoys getting it, too. Choices for food certainly get limited when there's no refrigeration! I love getting to share happy endings. Thanks for reading! Yes, Bean has no idea how he truly paved the way for me to get and keep Lele. He was such a sweet boy; I hope his ending is as happy as hers. Yay! I'm so glad LeLe is healthier thanks to her food, and your dedicated care! Thanks for sharing her story. And thank you for fostering so many animals in need, and occasionally absorbing a foster into your brood! I'm going to check out that "rawrev". I'm not into feeding Rita straight up raw food - and I tried another brand of freedried, but she went off it after the first few times of really liking it. I do the same as you - a high-end kibble (we do Fromm at the moment) with a scoop of either rotating organic canned food, or this organic "soup" that I make for her.